Today, the consumer faces more diverse websites, media, and advertisements than ever before, and in order to stand out, businesses need a way to craft some seriously engaging content. But the problem is a little more in-depth than that. 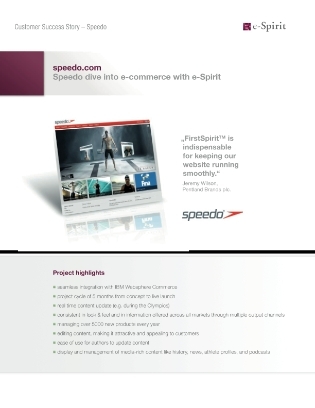 A CMS solution needs to be able to handle multilingual and multichannel content that can be edited by virtually anyone in the workforce easily and efficiently—the primary reasons that drove Speedo to reconsider their entire CMS platform. Access the following case study to reveal the CMS solution the Speedo implemented to optimize customer communication in view of the local markets, countries, and regions. Also learn how they were able to reduce content conflict and ensure brand consistency across their entire influence.